Internet is laden with informative and knowledgeable content. However, online world does have a dark side resulting into negative thoughts and deadly results. Besides cyber-bullying menace on the internet, posting suicidal content resulting into death is also a very grave emerging problem. According to the World Health Organization every year almost one million people die from suicide – isn’t that tragic? Lot of people meet virtually online on Facebook and share about their lives regularly. 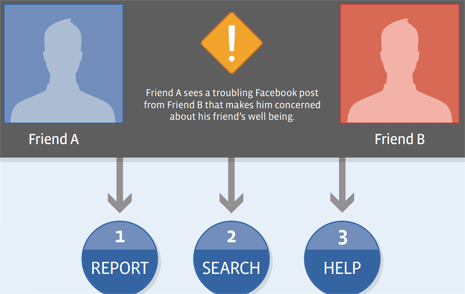 Have you come across a Facebook friend posting suicidal and disturbing content, that may result into a tragic end? You can act immediately and help rescue the whole situation using following methods. 1. Report Suicidal Content – Use this contact form to immediately report suicidal content to Facebook team. Make sure you enter full name of the person in question, url address of the person’s profiles and the posted content. Additionally, you may upload screenshot for the content and write more information for better understanding of the issue in question. 2. Contact Suicide Hotline – Talking does help, hence contacting Suicide Hotline is a wise decision. Check this page for listing of Suicide Prevention phone number for different countries like United States, Canada, United Kingdom, Ireland, Germany, Australia, Brazil, India, Belgium, Denmark, France, Hong Kong, Japan, New Zealand more. 3. Identifying Suicidal problem – You can check these online resources to find more information in order to properly identify suicidal problem in question. It has country-wise website listing of various organization working in the field of suicide prevention. Above tools and resources are useless if you do not use them at appropriate time. In suicide suitation, things change very quickly – hence reporting, helping and supporting at the earliest is best possible solution to help your online friends. How to upload photos & videos to Facebook by email?